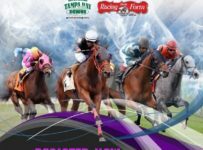 The final turf stakes at Tampa Bay Downs this year are a pair of $100,000 five furlong dashes on the turf. The first co-feature is the Lightning City Stakes, in Race 6 for fillies and mares 3-years-old and up. For which a handicapper can make a case. Here are some to consider. The 9/5 morning line favorite is SMILING CAUSEWAY (2) from the barn of ace turf trainer Arnaud Delacour with top jock Daniel Centeno in the irons. This sophomore filly has 2 wins and a place at this trip. The Delacour-Centeno combo is clicking at 36% now. EVERYTHING LOVELY (8) is a major player at 3/1 having won the prep for this event two years in a row. She was third in last year’s edition of the Lighting City after a less-than perfect journey. Appears to be back in fine fettle now and has won before with veteran Jose Ferrer who is back in the saddle and riding in top form again, after recovering from serious injuries. Next, we have MY SWEET DOVE (4) from the powerful Ralph Zadie outfit with regular rider Edgar Zayas shipping in from Gulfstream with the mount at 5/2. She has won in Tampa before and wouldn’t be a shock here. Finally, we have a couple of longshots that could upset the whole thing. A wild card at 20/1 is J’S INDIAN CHARM (7) who has won her last pair of starts on dirt. The Maria Bowersock charge appears very sharp now and could be dangerous if she takes to the sod in her first try. Red-hot Ron Allen Jr. stays on, wins at 27% with this barn. SYLPHIDE (9) at 8/1 is another who could take it all. She runs well fresh and has had 4 works for trainer Jane Cibelli who gives a leg up to Antonio Gallardo who rode this filly to a good place finish in an Allowance at Monmouth last August. The second half of the stakes feature is the Turf Dash for three-years-old and up. It is Race 8. Unlike the prior stakes, this race has a clear cut favorite at 8/5 in PAY ANY PRICE (3) in Race 8. 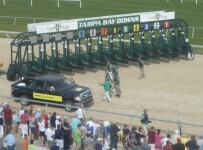 This gelding has won 8 of 12 attempts at this distance and comes into Tampa on a two-race win streak. This Zaidie-Zayas runner will take some beating here.